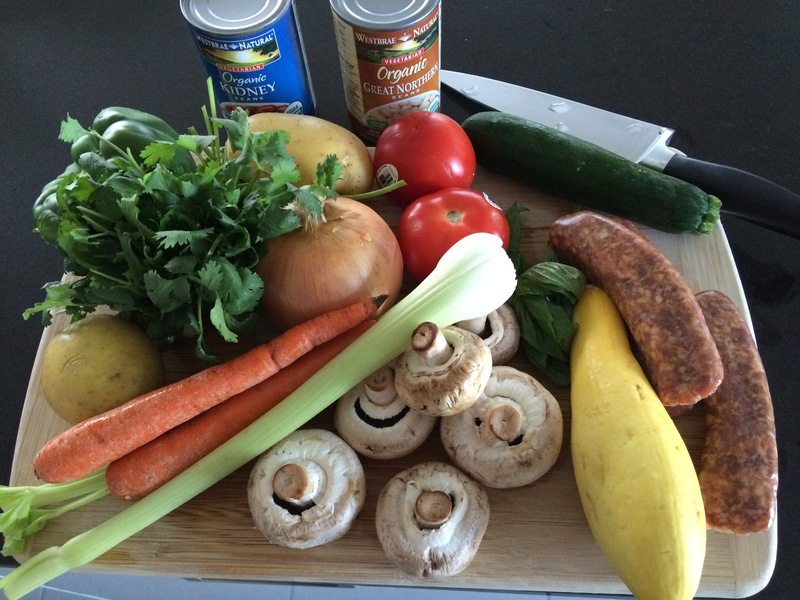 All this goes into the pot of soup I make once a week (plus a cup of pasta, and some lemon juice, not shown). It’s really easy to make, and always turns out great in 20 minutes. You saute the usual mirepoix (onion, carrot, celery) first, adding garlic in at the end. When the onions are translucent, you add in all the chopped ingredients, water, and some broth or bullion. I add the liquid from the cans of beans, and usually hold off adding the zucchini, squash, and bell pepper until the last 7 minutes of cooking, when I also add the pasta. All together, it only takes 20 minutes of total cooking time, with very little prep. After cooking your own soup, you wouldn’t even consider eating canned soup again. That stuff is junk food by comparison. Campbell’s says “Soup is Good Food”. I agree, but wouldn’t consider a can of Campbell’s to be good food. This looks amazing. Do you vary your pasta at all? I started with whole wheat elbow macaroni, but now I use “white” small shell-type pasta. I have some orzo that’ll I use next time.